And we were then, a stone's throw away, high in the Palazzo Ferraro, opposite the bubbly roof of the little duomo. Strange dark winter morning, with the open sea beyond the roofs, seen through the side window, and the thin line of the lights of Naples twinkling far, far off. Palazzo Ferraro still exists, indeed is high on the list of places to stay on the island of Capri, but it has been gussied up. It no longer looks like a black and white postcard from 1896. And I see my dream dissolving. Melting in the sky’s embrace. It is not clear who did the translations. They really are from Scheffel's The Trumpeter of Säckingen, so popular that by the 1920s, it had run through more than 300 printings and been made into an opera and a film. And there really is a German town, Säckingen (today Bad Säckingen). It is in the southwest corner of Germany on the upper Rhine near Basel. 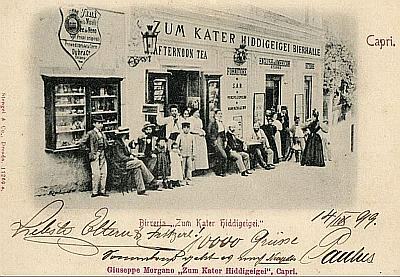 It also has an inn called Zum Kater Hiddigeigei.